This book is similar to Matthew Hayden’s Standing My Ground. Both Langer and Hayden were not only good friends and opening batsmen whose careers followed surprisingly similar patterns but both brought out their respective ghost-written autobiographies at a similar time. 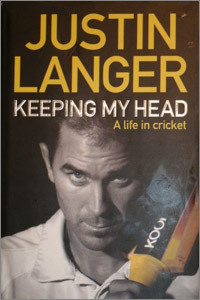 Langer’s book interestingly includes some sections written by his wife, Sue, and is well laid out and presented. There are thirty three chapters which is fewer than Hayden’s book but everything is covered in good detail and in a chronological order. Much is made of the significance of the baggy green cap and Langer was undoubtedly proud of leading the Australian song after every Test victory and the book includes comments from five previous songmasters and the present incumbent, Michael Hussey. The book might have benefited from a statistics section. After all, Langer score more runs than Sir Donald Bradman before retiring shortly afterwards and this, coupled with an eventually highly impressive Test record and it would have been nice to have seen a section highlighting this. An index might also have been a useful addition. The book is a very frank and open account of both the anxieties which Langer endured and also the role of his family and for his considerable charitable work for which, along with cricket, he was honoured in 2008 with an Order of Australia medal. Overall, a very interesting book.